A Salute to "Old Filthy"
I want to credit Hank's Truck Pictures for the circumstances that allowed this story to be written. A few years ago I was scrolling through the postings of the various trucking pictures and was particularly interested in the collections of early trucking pioneers. I wasn't there in the early days, 40' & 50's when driving was a real challenge by the toughest of men but I did see road time in the 60's and 70's. 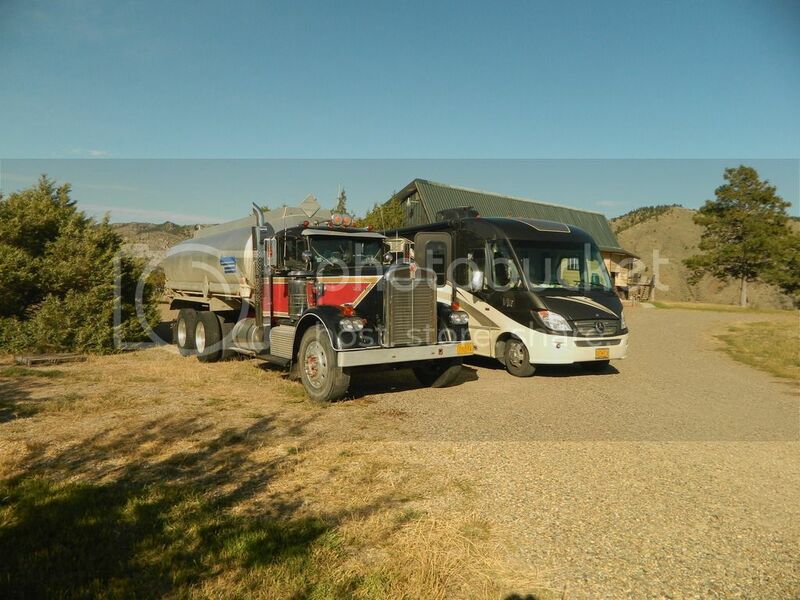 After knocking around driving as a beginner doing more damage to clutches and gear teeth than I was worth, I finally landed a dream job with a fuel hauler in Bozeman, Montana. Up until then I'd hauled hay, grain, lumber, sheetrock, 100# bags of cement, and the final insult, bone meal. Nothing stinks like cooked bone meal and after you've unload 40,000 lbs of what's left at the end of a slaughter plant, you do not get back into the truck, you walk to the nearest shower with clean clothes. A job where you can put on a pair of gloves, hook a hose to a Camlock fitting, and turn a valve to unload is the perfect job. My new boss, Gene Ballinger, was one of the true pioneers of trucking. 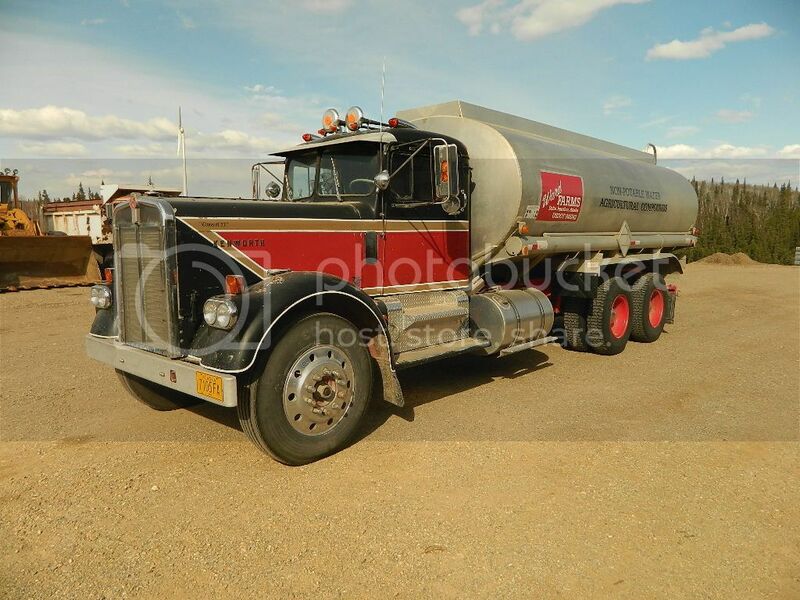 He began his career in 1945 hauling fuel out of Billings Montana. He bought his own truck and was leased to common carriers in the area. Even though his truck had the carrier's name on the door, Gene built a reputation of service guaranteeing that the delivery accounts he served were loyal and would follow Gene wherever he worked. In those early days trucks were powered by Cummins 220's or 250's and hauled maybe 5000 gallons in steel tanks on narrow roads. There were no interstate highways and it could take a long day to deliver fuel to a station a couple hundred miles away. Trucks were rough riding, noisy, and tiring to drive. Gene bought his first new truck in 1957, a Kenworth 925 with a 250 Cummins, 5 X 4 transmission and Rockwell rear ends. It was his pride and joy, he kept it in top condition, and it made him a good living. 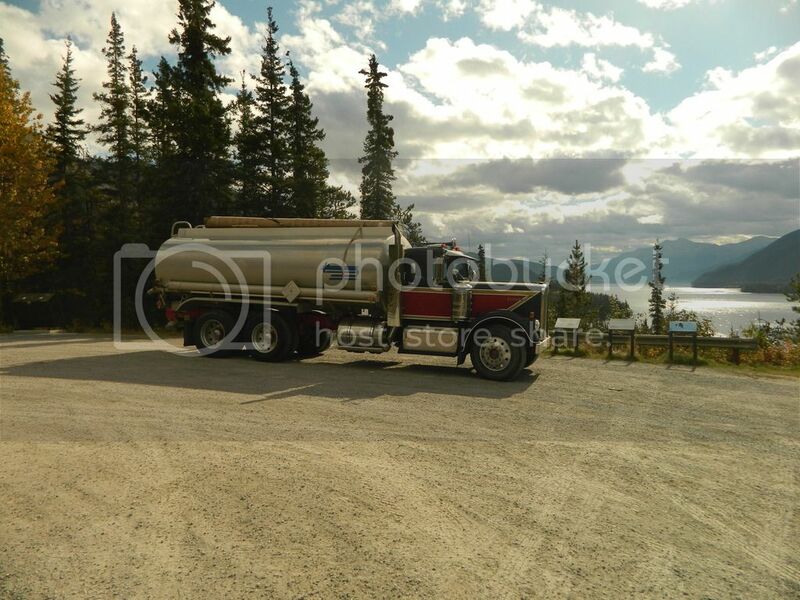 He hauled fuel all over Montana and Wyoming and was well known and liked by the trucking industry. He learned early that service, punctuality, and honesty were hallmarks that made a strong business. When I started working for Gene in the late 60's he'd moved to Bozeman and hauled out of the pipeline terminal. You may wonder how a greenhorn driver like me landed that dream job. It was a fluke really. I had left resumes with all the carriers in Bozeman because I wanted to be based closer to home. Gene took mine but didn't offer any encouragement and dropped it on his desk. As it turned out, soon after that his long time driver finally got tired of working Gene's 24/7 schedule and up and quit. Gene was left to haul all the loads himself. Gene was a non-union company while all the other bulk carriers were union. He wouldn't touch any of their drivers with a ten foot pole. He was desperate and called me out of the blue to come in and talk with him. No cell phones then so he got ahold of my wife who chased me down at a truck stop in Helena where I'd laid over for the company I was driving for. She & I talked, she jumped into our Pontiac Grand Prix SJ and drove the 100 miles to pick me up in just over 1 hour. We raced back to Bozeman and I caught Gene at the loading rack looking bleary eyed and tired. We talked awhile (he'd already spoken to a few people who knew me) and he offered me the job. I asked "when do I start" and he answered "right now, get in the truck". He road with me for a couple town deliveries showing me the loading procedures and unloading locations and then he turned me loose. I remember that he dozed off and slept as we were hauling to the stations. I was there at the right time & place. Gene paid and treated me very well and I became a loyal company man. In full disclosure, you may wonder what happened to the truck I left in Helena that day. I called the dispatcher, made up some excuse, quit, and told him where the keys were. Later I felt guilty and called the owner of the company, Dirk Irwin, at his home and apologized. The dispatcher hadn't told him about my stunt yet so he took it well. Your reputation follows you wherever you go and it doesn't do any good to burn your bridges. I drove a 1966 Kenworth truck & pup with a 318 Detroit, 4X4 trans, built as light as possible, and capable of carrying 10,000 gallons. When times were busy the truck ran round the clock with me driving the day shift and Gene driving at night. During those times, Gene rarely slept. He would do paperwork and mechanic during the day and take over from me to haul loads at night. He was very adept at getting 15 minute cat naps over the steering wheel. During those years Gene had sent his 1957 KW up to Shelby Montana to haul fuel along the Hi-Line on Hwy 2. I would occasionally go up and spell off the driver and spend time driving the 57. Gene was a good boss and he treated my family very well. My family and I moved to Alaska in 1974 but we kept in touch with Gene over the years. At one of the last times we visited Gene he showed us a collection of trucking pictures he'd taken over his career. So when I got to looking at the collections in Hank's Truck Pictures, I decided to launch a quest to find and publish Gene's pictures. Gene had died in the 90's and I knew nothing other than having seen his obituary. Gene wasn't married and didn't have any children so I had no way of knowing where his belongings ended up. I found and talked to his 92 year old sister in Florida and his nephew but nobody knew what happened to the pictures. That was frustrating and I struck out and never have found the pictures but along the way I stumbled onto the BIG prize. Just before he died, Gene sold his 57 KW to a friend in Montana, Don H. I contacted Don and we stopped by his place one fall when we were driving through. 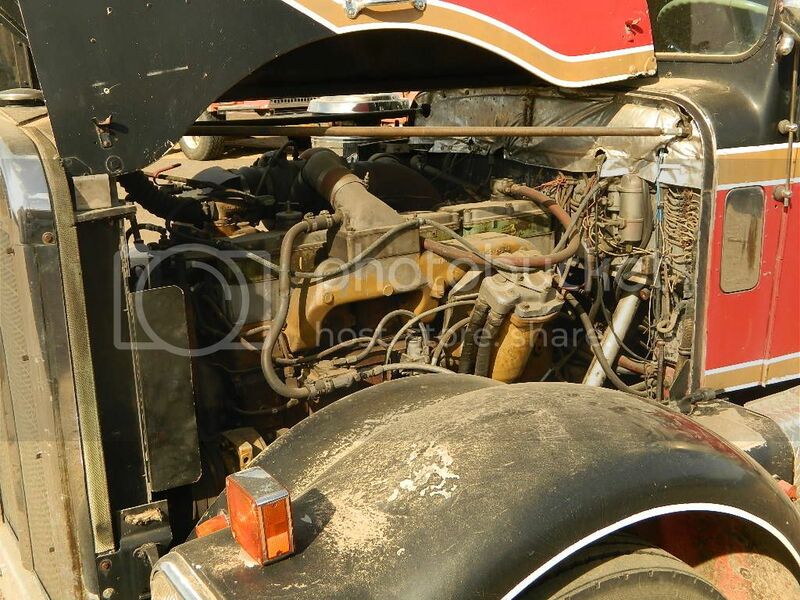 We reminisced about the old days, Gene, and his 57 Kenworth. Don told me a story that answers the subject line of this posting. 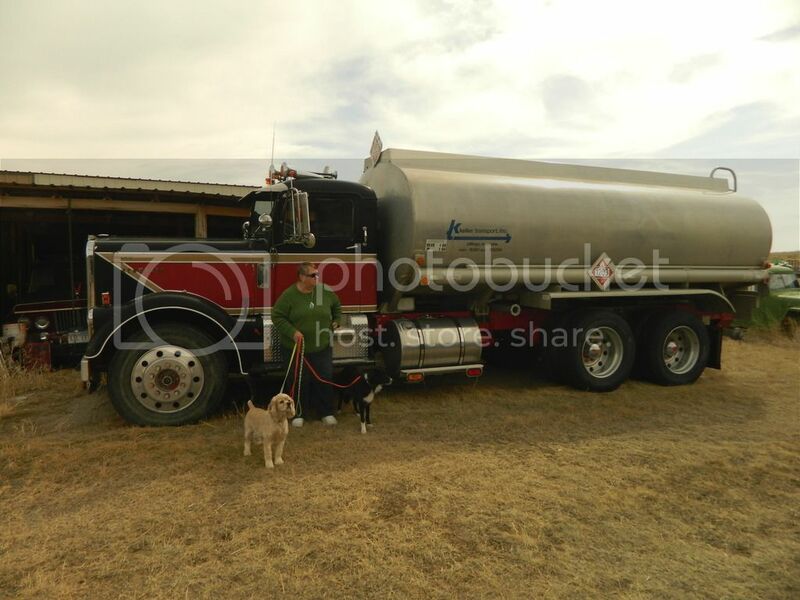 When Gene was driving his 57 KW around southern Montana he was a fanatic about keeping it clean and presentable. He would just say it was good business to maintain a professional appearance but he was also proud of his equipment. He didn't believe in wasting money on excess chrome but the truck was always clean and good looking. When Gene would come back from a trip during rainy or snowy weather it would be covered with mud and road grime. Before he could get it washed his trucking buddies would tease him about when was he going to clean his "filthy old truck". They knew he was serious about his truck but couldn't resist harassing him. Well, the name stuck and from then on it was known as Old Filthy. At a truck stop when he'd walk in, it'd be "Hey Gene, when are you going to wash Old Filthy?" The truck stayed clean and presentable when it went north and I also spent many hours of my own time cleaning the 66 KW I drove. I left my visit with Don and offhandedly told him if he ever wanted to sell the truck, give me a call. Low and behold about 6 months later I get a call from Don asking me if I still wanted to buy it. Of course, yes, without even thinking about it. He knew I greatly respected Gene's memory and he wanted the truck to be passed on to somebody who would take care of it. In September of that year Marcia and I drove our motorhome to Montana from Alaska and I got in and drove it back. It was a nice laid back trip, camping along the way, visiting with friends and we completed the trip with absolutely no problems along the way. Leaving Montana with "Old Filty"
Gene Ballinger's 1957 Kenworth is now in my retirement fleet with 1,284,333 total miles. That doesn't mean it's totally retired. 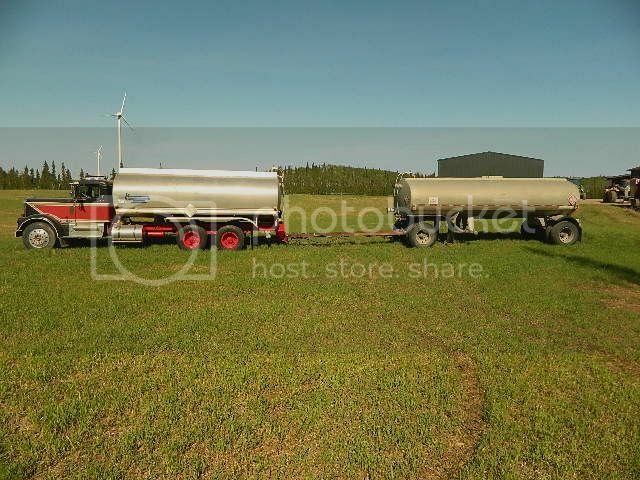 I have 2 and 3 axle pup trailers and I periodically lease the truck for fire control duties with the State of Alaska. While Don owned it he added the new fuel tank, steps, and chrome exhaust but basically it's the same old truck I drove in the early 70's. 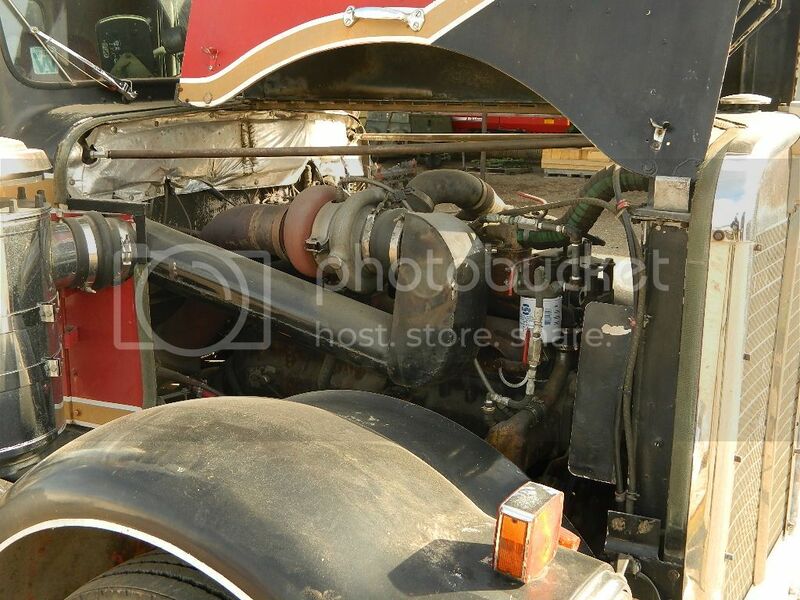 The engine is original except that it's been "souped up" with a turbo making it a NH 270. 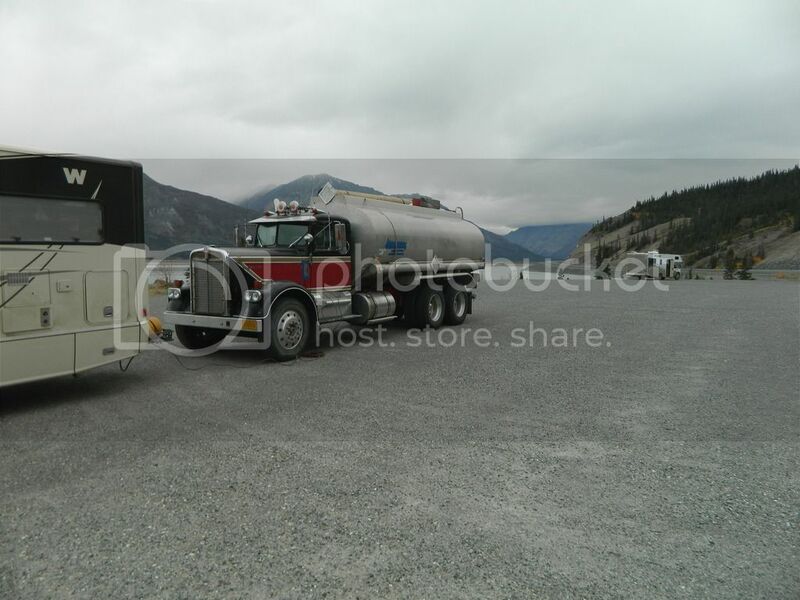 Same trans and rear ends but a newer tank. 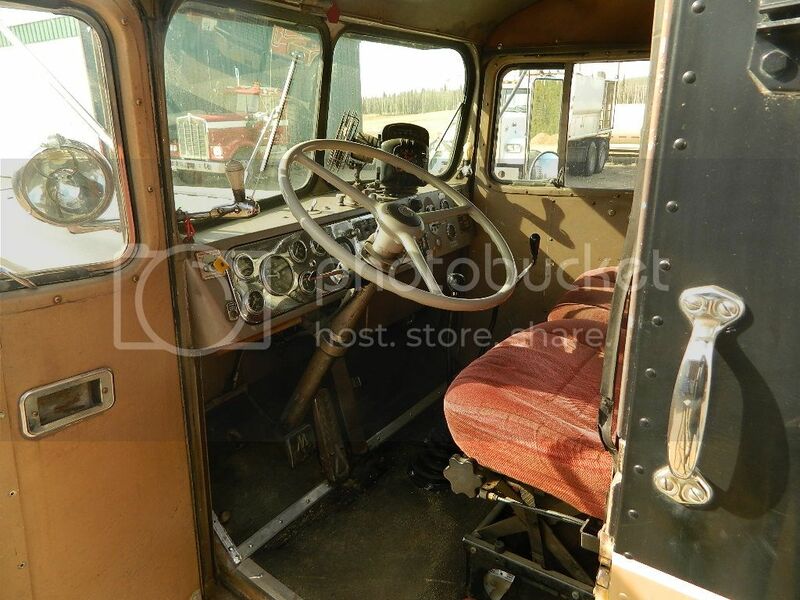 It's still totally dependable and has passed the DOT inspections as required for fire duty. Loaded with water I'm not fast but I do get there. I'm just sorry I couldn't find those pictures of his to share with you. So, if any of you have pictures of the early trucking days, get them digitized and posted. That's the only history and memory we have of these early trucking pioneers. I'm proud to have Gene Ballinger's truck and keep it up in his memory. I think he would be satisfied with my care of "Old Filthy" and proud that it's still working. On another post I'm going to show a few pictures I took while I was at Don's place. He was a classic KW collector in his own right. I'm glad I was satisfied with just getting the 57 and didn't do something stupid like asking if he'd sell any of these others. In the future I'll also be posting some stories of my experiences working for Gene those years. You may find them educational, entertaining, and noteworthy. Unless somebody suggests differently, I'll keep posting to the "Old Trucks" post. It fits me and my age. Re: A Salute to "Old Filthy"
Thanks for posting, great story. Looking forward to more of your posts.